Tummy Tuck with a Body Lift and Buttock Augmentation at Cincinnati Plastic Surgery. 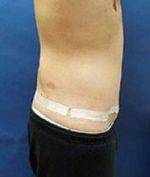 The scar on the right buttock can be improved with a scar revision. 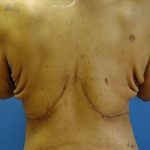 Tissue breakdown is one of the most common complications following body lift surgery. Click here to contact Kurtis Martin and set up a consultation. Longitudinal medial thigh lift. She also had a reverse abdominoplasty. Bariatric patient with total bodylift. abdominoplasty, and longitudinal medial thigh lift. 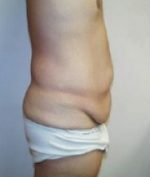 Gastric bypass patient who underwent a total bodylift with longitudinal medial thigh lift. This patient experienced a 100 pound weight loss following lap bound surgery. She complained of loose skin on her thighs, abdomen, and buttocks. She underwent a bodylift with auto augmentation of the buttocks, abdominoplasty, and longitudinal medial thigh lift. Notice degree of correction of medial thighs and increased projection and volume of the buttocks. 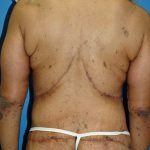 A bariatric patient with a body lift and auto augmentation of the buttocks. 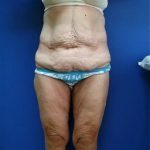 This patient experienced weight loss with resulting loose skin in her abdomen, thighs, and buttocks. She underwent a bodylift with abdominoplasty. This male patient lost 100 pounds by diet alone and had liposuction of his breasts and a total bodylift.